Polyactium refers to the star-like, many-flowered non-branched inflorescences of most species in this section. Plants with naked underground tubers and reduced perennial stems above ground, in one case with swollen stems and no tubers. Never spiny, but with persistent petioles or stipules. Leaves lobed or pinnately divided. 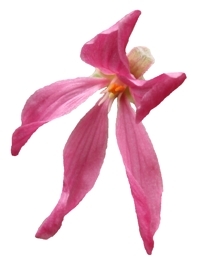 Flowers with subequal petals, with hypanthium longer than pedicel, night-scented. 6-7 fertile stamens. Basic chromosome number, x = 11. The section is further divided - see a separate page on the subsections of Polyactium. amatymbicum (Eckl. & Zeyh.) Harv. amoenum Salisb. syn. lobatum (Burm.f.) L'Herit. anethifolium (Eckl. & Zeyh.) Steud. arenarium Eckl. & Zeyh. syn. lobatum (Burm.f.) L'Herit. bicolor (Jacq.) L'Herit. syn. lobatum (Burm.f.) L'Herit. caffrum (Eckl. & Zeyh.) Harv. callosum E. Mey. nom. nud. syn. anethifolium (Eckl. & Zeyh.) Steud. carotaefolium Hoffmannsegg nom. nud. syn. triste (L.) L'Herit. coniophyllum (Eckl. & Zeyh.) Steud. syn. triste (L.) L'Herit. daucifolium (Murray) Salis. syn. triste (L.) L'Herit. daucoides Jacq. syn. triste (L.) L'Herit. elongatum ex Steud. syn. triste (L.) L'Herit. filipendulifolium (Sims) Sweet syn. triste (L.) L'Herit. flavum auct. mult. non (Burmf. f.) L'Hérit. syn. triste (L.) L'Herit. geifolium E. Mey. syn. lobatum (Burm.f.) L'Herit. heracleifolium Lodd. syn. lobatum (Burm.f.) L'Herit. heracleifolium Sweet nom. inval. syn. radulifolium (Eckl. & Zeyh.) Steud. hibridaefolium (Eckl. & Zeyh.) Steud. syn. radulifolium (Eckl. & Zeyh.) Steud. hybridaefolium (Eckl. & Zeyh.) Harv. syn. radulifolium (Eckl. & Zeyh.) Steud. laxatum Harv. syn. triste (L.) L'Herit. millefoliatum Sweet syn. triste (L.) L'Herit. moestum Hoffmannsegg nom nud. syn. triste (L.) L'Herit. multiradiatum E. Mey syn. radulifolium (Eckl. & Zeyh.) Steud. multiradiatum Eckl. & Zeyh. syn. triste (L.) L'Herit. obtusifolium Knuth syn. woodii N. E. Br. oxalidifolium Hort. ex Sweet syn. triste (L.) L'Herit. papaverifolium (Eckl. & Zeyh.) Steud. syn. triste (L.) L'Herit. peucedanifolium (Eckl. & Zeyh.) Steud. syn. anethifolium (Eckl. & Zeyh.) Steud. quinquevulnereum (Andrews) Persoon syn. triste (L.) L'Herit. radulifolium (Eckl. & Zeyh.) Steud. spondilifolium Steud. nom. inval., syn. lobatum (Burm.f.) L'Herit. spondyliifolium Salisb. nom. inval., syn. lobatum (Burm.f.) L'Herit. spondylifolium Harv. nom. inval., syn. lobatum (Burm.f.) L'Herit. triste var. daucifolium (Murray) Harvey syn. triste (L.) L'Herit. triste var. filipendulifolium Sims syn. triste (L.) L'Herit. triste var. laxatum Harvey syn. triste (L.) L'Herit. tuberosum Steudel syn. triste (L.) L'Herit. This site and all subpages were created and are maintained by Matija Strlic. All photos ©Matija Strlic unless otherwise indicated, 2000-2019.